The other day we posted about getting ready for Wishbone Day. We're using today's post to remind everyone why Wishbone Day is not a fundraising event. In the video Jessie J (feat B.o.B) sings "It's not about the money, money, money. We don't want your money, money, money. We just wanna make the world dance, forget about the price tag..."
What? (I hear you say!) No money? How can I make a difference to people living with OI?? What is this all about if you don't want the money?? We want you to use Wishbone Day and the Wishbone Day logo to promote awareness and to celebrate our lived experience of OI in all kinds of creative, fun, and exciting ways!! You'll be amazed at what you can achieve when the focus is on promoting awareness and celebrating life instead of raising money! We were, when we first tried it!.... Magic happens! Give it a go! and then let us know how it unfolds. We'll post your Wishbone Day stories through the Wishbone Day website for everyone to enjoy. Ok, Ok but what if ... I still want to raise money? - If you do want to do a fundraising event on another day, please contact your local OI Foundation or Association. We know they'd love your energy and support! If you're not sure how to contact your local OI Association check out our links page or drop us an email and we'll help you locate an OI association that can support you. Great, but what if ... my awareness event just happens to raise some money? - We know that there are times when the natural process of awareness sometimes leads to funds being generated. 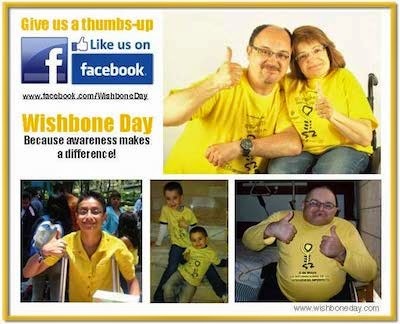 Many times once people have had fun at a Wishbone Day event they naturally want to contribute further. When this happens you should tell them that your local OI foundation would love to hear from them! You could also make arrangements with your local OI association or contact your local rotary club to partner your event. Rotary? Why should I contact them? You can learn more about how Rotary can assist the growth and development of Wishbone Day here. It is uber important to include your local Rotary when there are any monies involved. Wishbone Day is a global event with varying laws and regulations in various countries around the world. Our Rotary partners will ensure that when funds are raised through Wishbone Day that they remain secure and are used to support legitimate and recognised OI programs worldwide. Rotary are also one of the largest community organisations in the world so involving Rotary in as many ways as possible gives us great potential to make a difference worldwide! Leave us a comment and let us know how your Wishbone Day event goes and don't forget to share with your family and friends! Do you cast shadows or open doors? Sean Stephenson -- Living the Good Life with OI! Your Wishbone Day. Your Way!